I enjoy reading Melissa Clark’s column in the New York Times each Wednesday. She ‘s witty, inventive, curious and she knows her way around a recipe. I mention her because it was just about this time last September when she wrote about a much beloved plum cake made popular by Marian Burros back in the 1980’s. It jumped out at me and I realized that I hadn’t had that cake in more years than I could remember. I searched for the original recipe in my files and there it was – yellowed and somewhat tattered. I took it out and put it in my folder of foods that I someday want to convert to gluten-free. I’m happy report one year later that I’ve finally gotten around making the infamous New York Times Original Plum Torte with gluten-free flours. This past week when I started seeing piles of the small Italian “prune” plums specified in the original version (and when my power came back on after Hurricane Irene), Clark’s column roared back into my mind. I bought a big basket of ripe plums at a local green market and set to work. I used my brown rice flour mix, a small amount of xanthan gum, and a 1/4 teaspoon extra baking powder to get it rise well. I also added some vanilla extract to hide the lack of wheat and hopefully, make it even more delicious. The recipe converted so beautifully you might have thought it was always gluten-free. I’m really glad I made it and so were my friends; I didn’t have a lot left over, so I’ll have bake it one more time (oh, darn) in order to test how long it will last in the freezer. But that’s OK, because we’re all looking forward to eating it again (and yes, I’ll hide some in the freezer this time). Are you wondering how long it would last in your house? Try it and see! 1. Preheat oven to 350ºF. Position rack in lower third of oven. Grease a 9-inch spring form pan with cooking spray. 2. Cream the sugar and butter in large bowl of electric mixer. Add the brown rice flour mix, baking powder, xanthan gum, salt, eggs and vanilla extract and beat well, about 2 minutes at medium speed. 3. Spoon the batter into prepared springform pan. Place the plum halves skin side up on top of the batter. Sprinkle lightly with cinnamon sugar. 4. Bake about 55 minutes until golden brown and toothpick comes out clean from the center. Remove and cool on rack. Serve room temperature or chilled. Store torte covered tightly with plastic wrap in refrigerator. Cooks note: To make Cinnamon sugar combine 1 – 2 tablespoons granulated sugar and 1/4 – 1/2 teaspoon cinnamon. This looks amazing. I will have to get some plums! I have my plum tart baking now. Will serve it tomorrow and give you a full report! If it tastes as good as it looks, I will be very happy. It is my new favorite cake! My family is divided between your sour cream coffee cake with apples and this new cake. 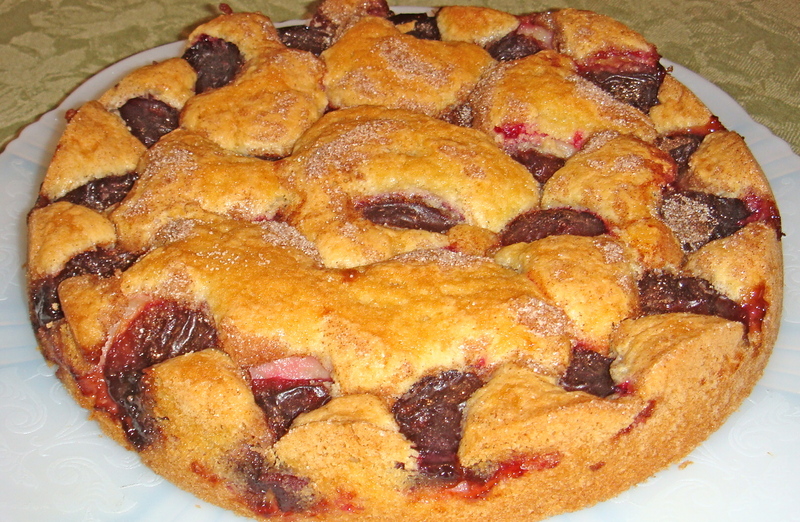 I am wondering what you think about making this plum cake with apples instead of plums….might try that next! Thanks for another winner of a recipe! I think it would be good with apples, cherries, and maybe even pears. Might have to try it myself. I’ll be going apple picking soon. I tried with a blend of peeled apple and pear slices. It was awesome! Good to hear this. Thank you for giving me the update! Now I’m looking forward to making it again even more.